grandparents | Enough for now . . .
Grandpa’s straw hat . . . I never remember my grandfather Rufus in public without a straw hat. As a bald man, it was an essential part of his wardrobe as he went out into the blistering, radiant sunshine of the deep south. For him, it was always an off-white straw hat. I never remember him in a dark hat. Then again, in the deep south, with the heat and sun bearing down most of the year, perhaps straw, as long as it was winter white, passed muster year round. Unlike my grandfather, for the last few years my fall and winter look includes felt fedoras. The Midwest cold and wind require it. Still, my summer haberdashery is missing my grandfather’s straw look. Straw was an essential addition this year. I bought a straw hat on the island of Mykonos this summer. While the location of the purchase may be a bit exotic, to find the perfect straw fedora was a essential goal of summer. What can I say; I happened to be in the Greek isles and there it was. Many times I imagined the hat. Something distinctive but not as stiff and formal as grandpa’s. I wanted a strong textured hat with a broad brim and a distinctive band. As I turned the corner on the very narrow stone paved street of Mykonos with its white-washed buildings with brightly colored trim and terra cotta roofs pressing on me, I was instantly smitten. There, on the street vendor’s rack, were two, one with a black band and one with a deep, inky blue band. They were strong, durable hats, yet still a bit floppy. The hat lady thought I wanted the black band (more conventional I suppose). “No,” I objected, “I want the inky blue one, it will always remind me of the Aegean.” I asked for her best price. She stumbled a bit and then gave me a few euros off. I was satisfied (I would have paid full price; this was THE hat). My new hat made me smile and remember fondly my grandfather, the man after whom I am named. It was a perfect! While walking about Knossos on Crete the next day, I saw a silhouette on one of the ancient walls. 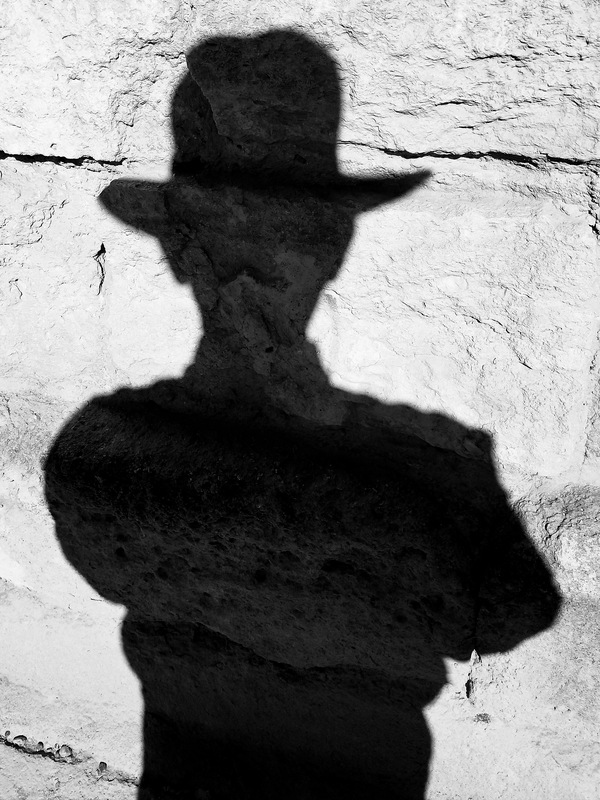 To my surprise and joy, it was not my shadow; instead, I say the shadow of my grandfather, hat and all, looking back at me. Walking about the ruins of this Bronze Age civilization, imaging the peoples who walked those paths 3500 years ago, it was a joy to realize my grandfather was walking with me. If I had known it only took a hat, I would have bought one long ago. On the other hand, maybe it was not just any old hat. Maybe it was this hat waiting for me to find it on an island in the Aegean. Back in the sunny Midwest, his shadow still walks with me. Grandpa is 117 years old this year. I am pleased to report his shadow still has a spring in its step. This morning, sitting at the coffee bar, sipping hot green tea, and savoring every bite of lemon lavender pound cake ( at a favorite neighborhood bakery–Heirloom Bakery & Hearth), it is pouring down rain outside. Some great 60s era music is playing and I am feeling remarkably tranquil. I am reading a great book (Outlaw Christian ) published recently by a young theologian ( @JacquelinBussie ) I met at a conference at the University of Virginia years ago. I am aware suddenly of a mysterious peacefulness filling me. I feel surrounded by the peace of God, embraced in God’s infinite capacity for love (quite the opposite of the hopelessness I wrote of a few blogs back). I am startled to attentiveness. What is this? My eyes wander over the room wondering what changed, what brings this presence of God? Then I realize it is aural not visual. The rain is pounding on the metal roof! Years ago, while my dad was in Vietnam and I knew my life could change in an instant, the only time I felt safe was at my grandparents’ home, late at night, tucked in bed, and the rain beating on the uninsulated tin roof above me. Alone, in the dark, under a pile of handmade quilts, the rhythm of the rain pounding on the roof somehow made me know God knew my fear and was with me always. I can’t explain it; but, I knew it. This morning, amidst the occasional clap of thunder and the rain beating its rhythm on the metal roof, me and 14 year-old me shared a moment. And God was there. And I felt safe, and peaceful, and loved. Once when I was very young . . .
Once when I was very young, grandpa took me on an adventure . . .
Grandpa was a very big man. He had strong hands with thick callouses. He had a deep belly laugh and a broad smile that would lighten the darkness. He had a bald-head that always seemed to shine. He usually wore a straw hat to cover his head. One day he took me on an adventure . . .
Grandpa raised cows. The big cows followed him wherever he went. In the spring, when he had to tag the newborn calves, he would calm the frightened calves and play with them. Once he asked me to catch a calf. I ran and ran and ran. I could never catch the calf. Laughing to his toes, grandpa stepped forward. In an instant, he caught the calf. In the evening, I would help grandpa feed the cows. With a mischievous grin, he would fill a five-gallon bucket with grain and send me across the barnyard. I think the bucket of grain weighted more than me. In late summer, grandpa let me help in the fields. Sometimes I would ride the tractor as we cut the hay. Sometimes I would ride the truck as we gathered the hay to the barn. To this day, I like the smells of the tractor, the field, and the freshly cut hay. I liked being so completely tired at the end of the day. It began like this . . .
One night, just before bedtime, grandpa told me he had a special place to show me. We left early, walking into the bright morning fog. Except for the soft whoosh whoosh of our boots on the dew covered grass, quiet surrounded us. Past the barns, through the field, to the edge of the woods, Grandpa said not a word; I did not know what to say. We pushed through the bushes and briers. We walked down a hill to the creek. 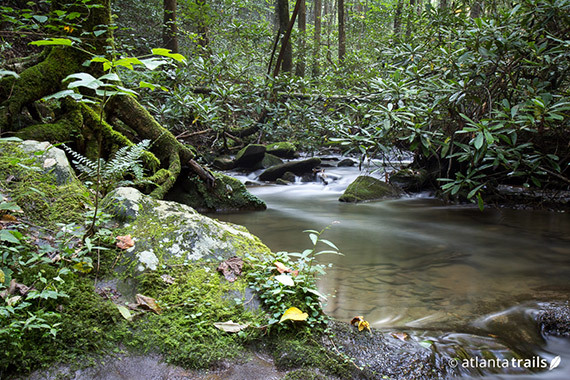 It was making bubbling and gurgling sounds as it flowed quickly over rocks and logs. As we walked, bullfrogs jumped from the bank, turtles dropped from their log perches, and salamanders slithered through the wet leaves. We walked deeper and deeper into the woods, deeper than I had ever been before. We came to a wide part of the creek. Grandpa said we would have to cross to the other side. I wondered how. As we turned a bend, I saw a huge fallen tree crossing the creek. It had been there a long, long time. Grandpa jumped onto the log and crossed quickly. He turned and called for me to follow. I was afraid. Grandpa encouraged me. Unsure, I climbed up on the log. With all the courage I could muster, I stood and slowly inched across the log. With relief, even a sense of pride, I jumped down on the other side. Grandpa had a twinkle in his eye. He patted me on my back. We continued to walk deeper and deeper into the woods, following the creek. As the rising morning sun shot beams of light through the canopy of leaves, the woods began to awaken. Birds were flittering about in the branches. Squirrels were scurrying from limb to limb in the treetops, barking as we walked past. An occasional rabbit would dash out of the briers. We even saw a raccoon by the clear creek, busy catching a breakfast of mussels and crawdads. Finally, we came to our journey’s end. Before me was the biggest oak tree I had ever seen. Even its lowest branches were higher than the surrounding trees. Gnarled root knuckles extended from its base in every direction. Deep, velvety-green moss surrounded the tree making a soft carpet all around. A large crystal-clear pool of water extended from the base of the tree. I could see fish swimming everywhere. On one side of the tree, bubbling up like a fountain, water was shooting from the ground filling the pool and sending a mist wherever the wind blew. The creek was born here. as I sit, half-awake, half-asleep in the lap of the big oak tree. I see grandpa’s smile and feel his calloused hands. I understand now why he wanted to take me on an adventure that day when I was very young.